Set in ancient Japan, Silent Samurai is a five reel, three row and nine payline slot that lets players enter the world of ninjas, samurai and other oriental wonders. Boasting an outstanding top payline jackpot of a cool £100,000 and immersive gameplay with loads of fun additional features, Silent Samurai is a game that most players are sure to love. 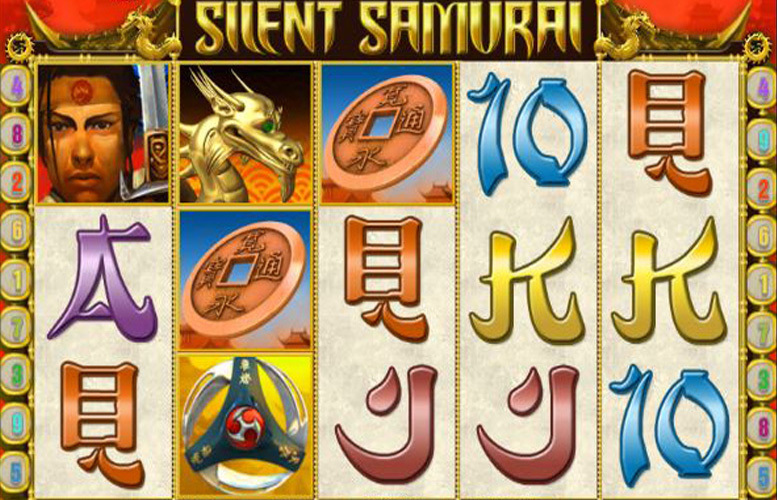 Silent Samurai is a slot which boasts an outstanding top payline jackpot of £100,000, as well as a multitude of other ways for players to win big. Betting amounts can be easily and strictly controlled by players, who can set their chosen number of coins to bet per line and the value of those coins. The fun and attractive theme combines with interesting gameplay to mean that Silent Samurai can deliver hours of fun. The slot’s oriental themed music gets a little repetitive and annoying, but can be turned off when desired. There’s little else to criticise Silent Samurai for. Japan in ancient times is the setting for the Silent Samurai slot, and the game’s symbols reflect that theme well. The reels show off images as diverse as oriental characters, ninja throwing stars and oriental dragons, and it is the latter which can make up the game’s most valuable combination. Five of the dragon wild symbols lined up consecutively along a payline is that most valuable combination, and pays out at an impressive level of 5,000 times the player’s bet per line. The maximum possible bet per line stands at £20, meaning that the overall top payline jackpot can be worth an awesome £100,000. As well as that outstanding top payline jackpot, Silent Samurai’s free spins and other bonus features also deliver numerous other ways to win. Those features and their potential benefits, then, are logically the next things to focus upon. 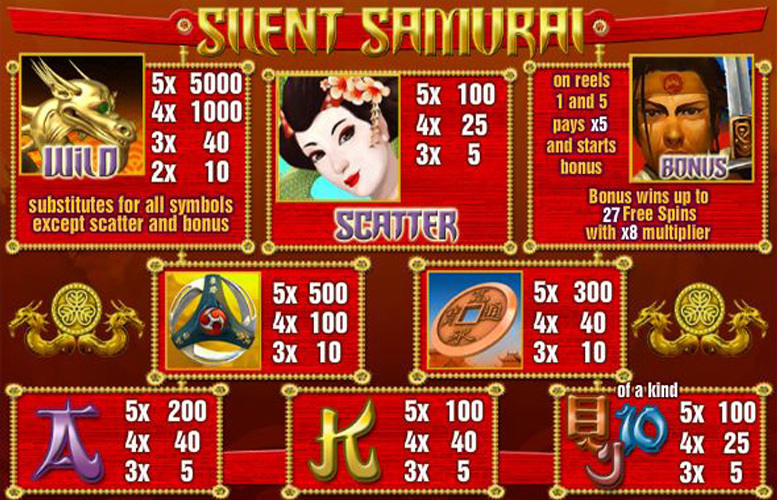 Silent Samurai’s fun and beneficial extra features include wild symbols, scatter symbols, a bonus game and associated free spins, and a gamble feature. As well as being able to make up the slot’s most valuable payline combination, the oriental dragon wild symbol can also substitute for all other symbols apart from the scatter and bonus symbol. That substitution will go towards making up the most valuable possible combination for any payline on which the wild symbol appears. Depicting a traditionally made up Japanese woman, Silent Samurai’s scatter symbols deliver immediate payouts when two or more of them appear anywhere on the reels. The maximum such payout is worth 100 times a player’s total wager for a spin and results when five of the scatters appear at once. Silent Samurai’s symbols also include a bonus symbol which, if it appears on reels one at five at the same time, triggers a bonus game. 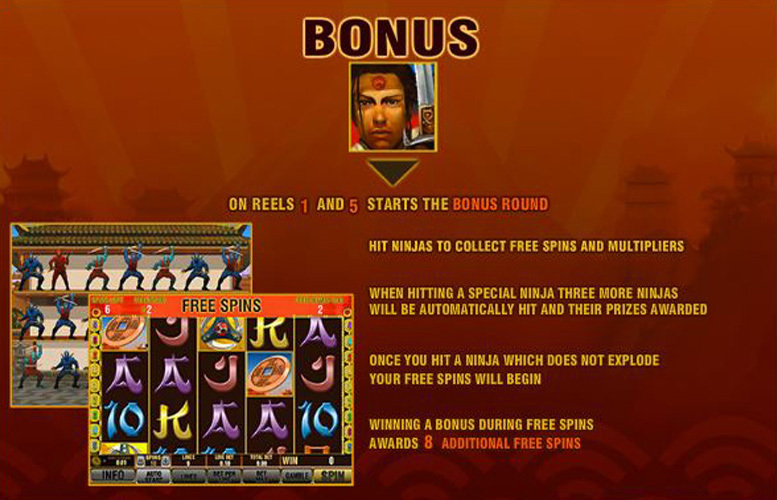 That game allows the player to hit different ninjas to collect free spins. The maximum number of free spins that can be won stands at 27 and those free spins can be subject to an up to x 8 multiplier. 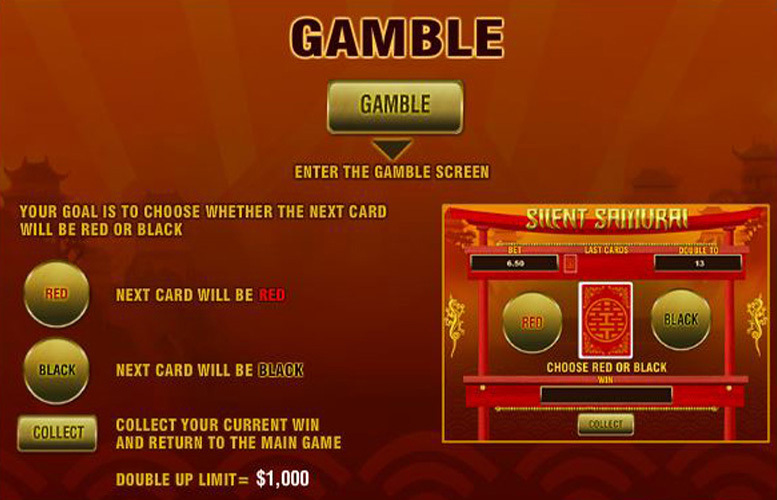 After every Silent Samurai spin, players are also given the option to take part in the slot’s gamble feature. That feature gives player the chance to double their winnings by guessing if a card will be red or black, but also means they will lose their winnings if they’re wrong. As well as the three special symbols associated with the slot’s extra features, Silent Samurai also includes a number of other potentially beneficial symbols. Those symbols are all themed around ancient Japan and offer payouts if three or more of them line up along the game’s paylines. Combinations of five matching symbols consecutively are the most valuable, and the highest paying of all – behind five of the wild symbols – comprises five ninja star symbols. That combination pays out at a rate of 500 times the player’s bet per line. Players who wish to alter the amount they bet per spin, have two different ways of doing so when playing Silent Samurai. Those are by changing the number of coins that they bet per payline and by altering the value of each of those coins. Anywhere between one and ten coins can be bet per each of the game’s nine paylines and those coins can be set at a value of between 1p and £2. That means that a minimum bet of 9p per spin is possible and that the maximum possible bet can be worth £180. Silent Samurai is an all-round outstanding slot that rates well in every possible area of comparison with other similar games. The slot’s top payline jackpot of £100,000 is more generous than almost any other you will find, and yet the game still offers a bonus game, free spins and scatter symbols to provide extra ways to win. The slot’s theme, too, is a fun and unusual one and is extended well across all of the game’s features and graphics. What’s more, in spite of including loads of additional features, Silent Samurai still remains a simple and easy slot to understand and to play. There really is very little to criticise about this exceptional five reel slot. This game has a rating of 4 / 5 with 844 total reviews by the users.